Colin Powell is the embodiment of the American dream. He was born in Harlem to immigrant parents from Jamaica. He knew the rough life of the streets. He overcame a barely average start at school. Then he joined the Army. The rest is history—Vietnam, the Pentagon, Panama, Desert Storm—but a history that until now has been known only on the surface. 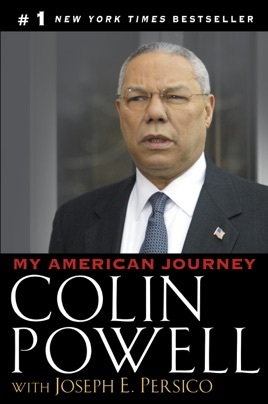 Here, for the first time, Colin Powell himself tells us how it happened, in a memoir distinguished by a heartfelt love of country and family, warm good humor, and a soldier's directness. I used this book in one of my graduate level courses. The was a very good read. I was impressed with his journey and how he became a major leader in our country as well as one of he most respected military leaders of our time, yet still remained humble throughout the journey. Very well done and enjoyable to read this amazing life story of a great, well accomplished General. Enjoy! Fabulous book from an outstanding man! A wonderful friend (thank you Joanne) recommended this book to me and once I started reading it I could not put it down. Every free moment I had I would be reading it. It's very inspirational, motivational and just plain a great read!